Why should I return medicines to the POD Program? By using the POD Program and properly disposing of unwanted pharmaceuticals and drugs, you will help us keep our rivers and drinking water clean and our communities and families safe. Properly disposing of unused medicines at POD locations reduces the risk that prescriptions will be mishandled and end up on the street, prevents avoidable poisoning of both children and adults, and prevents contamination of water resources. What is wrong with flushing medications down the toilet? When medications are flushed down the toilet or poured down the drain, most of these chemicals pass through treatment plants or septic systems ending up in our water resources and can harm aquatic wildlife, including fish and amphibians. We have more than 1,400 wastewater treatment plants in the U.S. and Canada that discharge 4.8 billion gallons of treated effluent into the Great Lakes Basin every day. Only about half of the prescription drugs and other newly emerging contaminants are removed by treatment plants, the rest end up in our waters. Septic systems are also not designed to remove the active drug compounds and most of these chemicals end up accumulating in our groundwater, rivers, lakes, and aquatic organisms. The Federal Government still recommends flushing certain medicines. What guidelines should I follow? We recommend that no drugs be flushed. You should bring your unused medications to one of the many POD locations where collected drugs will be properly destroyed of. Click here for disposal locations. Can drugs actually be harmful to fish and other aquatic life? Yes. Some of these chemicals interfere with or mimic natural hormones and disrupt reproduction, development, and behavior of fish and other organisms. For example, certain drugs can cause male fish to develop female characteristics. These "intersex fish" have been found in some rivers throughout the county, particularly downstream of wastewater treatment plants serving large municipal areas. These fish often do not reproduce. Are there any human health effects from medications in drinking water? Pharmaceuticals have been found in drinking water in trace amounts, either in parts per trillion or parts per billion. Currently, there is no conclusive evidence that medicines in drinking water are harmful to human health. However, scientists acknowledge they know little about the long-term effects of these drugs on people and how they might degrade or interact with other chemicals in the water. Why can’t I throw medications into the trash? Throwing medicines in the garbage, especially controlled substances like OxyContin and other pain relievers, is not safe because the drugs can be found and used by others such as kids, pets, and even burglars. Additionally, medication that is thrown in the trash will eventually end up in a landfill, which only delays the pharmaceutical chemicals from reaching groundwater or rivers and lakes. Leachate from landfills, containing medicines, is collected and piped or trucked to wastewater treatment plants before it is discharged into nearby rivers and lakes. What can’t I burn my medications in a burn barrel? Burning pharmaceuticals and their containers improperly (e.g., in burn barrels, industrial boilers) can contribute to air pollution. Uncontrolled incineration doesn't destroy drug components and it releases toxic chemicals, including dangerous dioxins, into the environment that can cause adverse health impacts. What happens to the medicines I drop off? Medicines collected at the permanent POD boxes are taken by law enforcement to the Kent County incinerator for final disposal. Medications collected at community collected events are separated into controlled and non-controlled substances. Controlled substances go with law enforcement and will be delivered to the Kent County Incinerator. Non-controlled substances are taken by a regulated company, Drug and Laboratory, and are disposed of by high temperature thermal destruction at licensed facilities. A controlled substance is a drug or other substance that is regulated under the Controlled Substance Act due to its potential for abuse and addiction. Examples include Oxycontin, Percocet, Morphine, Hydrocodone, Valium, Xanax, Adderall, and Ambian. The manufacture, distribution, possession, and transportation of such drugs are strictly regulated under state and federal law. Click here for a Drug Enforcement Agency (DEA) List of Controlled Substances. Incineration is currently the most environmentally sound disposal method and it ensures the chemicals are completely destroyed. I am unable to drop medicines off. Is there a home pickup service? No, not at this time. You can check with your local law enforcement office; some police departments will send out an officer to pick up medicines from seniors or anyone not able to drive. Where can I drop off my medications? For disposal locations, visit our Locations page. I am not from Michigan, how can I find out about disposal locations in my state? You can also contact your local household hazardous waste collection or recycling coordinator to see if your community has local pharmaceutical collection events or a drug take back program. What if there is not a disposal location in my area? If disposal sites or collection events are not available in your area, contact your local police department. If law enforcement will not take it, crush or dissolve the medication and mix it with an unappetizing substance such as kitty litter or coffee grounds. Place this mixture in a discreet sealed bag or container and hide it in the trash. This method should only be used as a last resort as it still poses a risk to public health and safety and the environment. You should never flush any medicines down drains or toilets. What can I dispose of through the POD Program? How do I prepare the medication for drop off? For POD Collection Events: Keep the medications in the original container for easy identification of the medicine but erase or black out all personal information from the prescription bottles. Do not remove the name of the medication as this is needed to properly sort and dispose of medications. For POD Drop Boxes: Solid medicines, such as pills and vitamins, can be removed from the original container and mixed together into a sealed plastic bag. Scratch out all personal information on the prescription label of your empty pill bottle, then recycle the container with the lid on. Be sure liquids are well-sealed or in a plastic bag to prevent spills; do not pour liquids directly into POD Box. Please do not place sharps in the POD boxes as this poses a risk to law enforcement officers when they empty the boxes. What can I do to reduce the quantities of unwanted and unused medications in my home? Purchase only as much as you need and take the medication as prescribed by your physician. When your doctor prescribes a new medication, ask the doctor to prescribe only enough to see if the medication will work for you and in the lowest dose advisable. That way, if the medication doesn't suit you, less goes to waste. Do the same for your pet's medications. Centralize all medications in one location secured from children and pets. This may help to limit inadvertent over-purchasing of products you already have. In order to preserve the quality of your medicines, store medications at proper temperature and humidity as recommended on the label. This is sometimes NOT in the bathroom medicine cabinet. Say “No” to physician samples if you are not going to use them. Why is the POD Program limited to residential use only? Businesses, such as pharmacies, hospitals, doctors' offices and pharmaceutical companies, are required to properly manage their drug waste under federal and state hazardous waste regulations. For more information about these requirements, visit the Michigan Department of Environmental Quality’s Solid Waste Program. How do I dispose of other items that are not accepted by the POD Program? IV bags: Empty bags are able to go into the trash. Check with your medical provider or pharmacy for disposal of bags that contain a fluid. Bloody or infection waste: Contact your local health department. For chemotherapy drugs: Contact your healthcare provider for proper disposal options. Thermometers, aerosol cans, hydrogen peroxide: Contact your local household hazardous waste program. For sharps/needles: Purchase a pre-paid sharps mail-back container or needle cutter that automatically stores the cut needles from a pharmacy. Needles can also be disposed of at most of the community collection events. For dates of community collections, visit our Locations page. 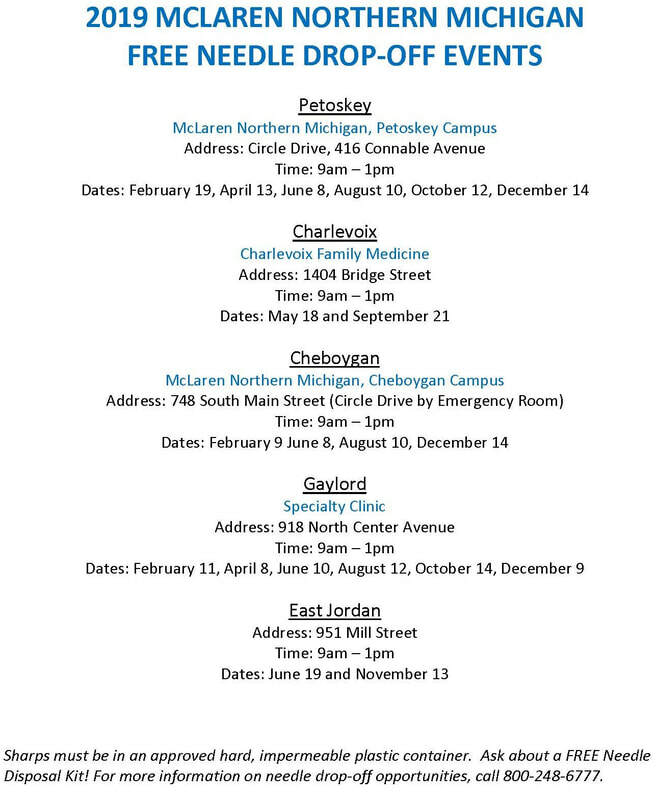 McLaren Northern Michigan hosts sharps/needle collection events, the dates are below.